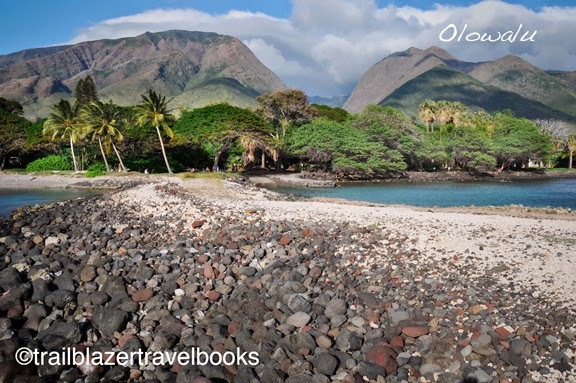 In 1790, what was left of an army of Maui warriors who were slaughtered in Iao Valley escaped by taking a trans-island trail that popped out here, at Olowalu Valley on the west shore of West Maui. Today, tourists in the know can escape what can be maddening traffic south of Lahaina by pulling a short distance off the road to Olowalu Landing. A few locals gather after work and on weekends, but this place is a quick getaway for visitors who appreciate quietude and beauty. The site of a sugar mill in the 1860s, the landing has a lawn and nicely treed shoreline, the spot to bag some rays before heading into protected snorkeling waters (most tourists swim at a busy roadside beach nearby). Kayakers also put in at the landing. The short walk out to the end of the compacted-earth structure leads to a viewing bench, where whales and turtles cruise by. Inland—on a road behind renowned Chez Paul Restaurant—is a short walk to Petroglyph Hill, etched with primitive drawings. The trailhead to Olowalu Valley is also on this road, although the overgrown path is very hard to follow. See page 58 of Maui Trailblazer.